This bunny (Edgar) means the world to my husband and me. He went missing three years ago now, and I can not even begin to tell you how much he is missed. I’m looking for him to get some kind of coherence and sanity back in my life. I need this bunny back. We both do. Please, please help. I would estimate it at about 4 1/2 – 5 1/2 inches. He could stand up by himself. His ears stood up and were fairly pointy, but were soft and you could move them back and forth. He was pretty soft, I’m not sure what he was filled with (it felt kind of like squeezing foam if you squeezed him), but his body wasn’t stiff — he wasn’t overstuffed. What you can’t see in the pictures is the little tail he had. It was quite small and I think might have helped him stand. It was sort of off-white, and dense. It was not poofy or big. It was like a small white pom-pom very low on his back, and touched the ground when he was standing. I don’t know what material he was made out of, but it was a little bit like felt. His tail was of a different material than the rest of him. 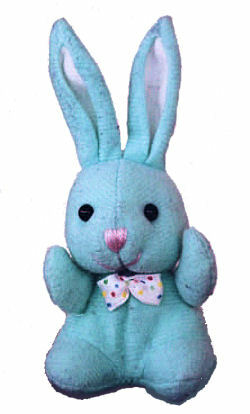 If you can help Erin find this Blue Bunny Rabbit, THIS SITE IS NO LONGER ACTIVELY MANAGED. Please use Our FREE FACEBOOK GROUP, including #021908-3 in the subject, .